The Schultz Fund is named for one of GPRA’s rescues, Schultz. His big presence brought big smiles to everyone who met him and he was a natural at providing emotional support to those in need. With his passing, his parents with the help of The Great Pyrenees Rescue of Atlanta established The Schultz Fund to create a nurturing legacy for people and PYRS for many years to come. The Schultz Fund raises funds through GPRA donations to be used specifically to provide scholarships to individuals to have their rescued PYR trained to be a certified therapy dog. 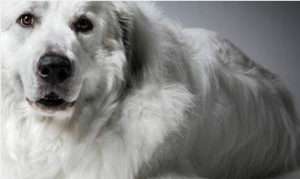 This scholarship is available to any PYR adopted through Great Pyrenees Rescue of Atlanta. It should be no surprise that Great Pyrenees make ideal therapy dogs and the fund’s namesake was no exception. PYRS are fun and easy to pet because of their size and also live-up to their nickname, “Gentle Giants,” as the breed is both gentle and lovable. If you would like to apply for a scholarship to help train your PYR to be a certified therapy dog please complete the form below.